On Monday a super nice lady from Seattle Magazine came over to photograph me in my garden. This is all part of La Grande Promotion for my new book. So, I did what any gardener faced with the prospect of a professional photographer in their yard would do – I spent all weekend trying to hide the fact that my garden is in that awkward stage between summer and fall where nothing really looks good. All the cucurbits that were succumbing to various mildews were yanked. Thousands of weeds that popped up like, well, weeds at the first drop of rain were dealt with. Yards and yards of woodchips were spread to freshen up paths; buckets of finished compost were sprinkled around plants. 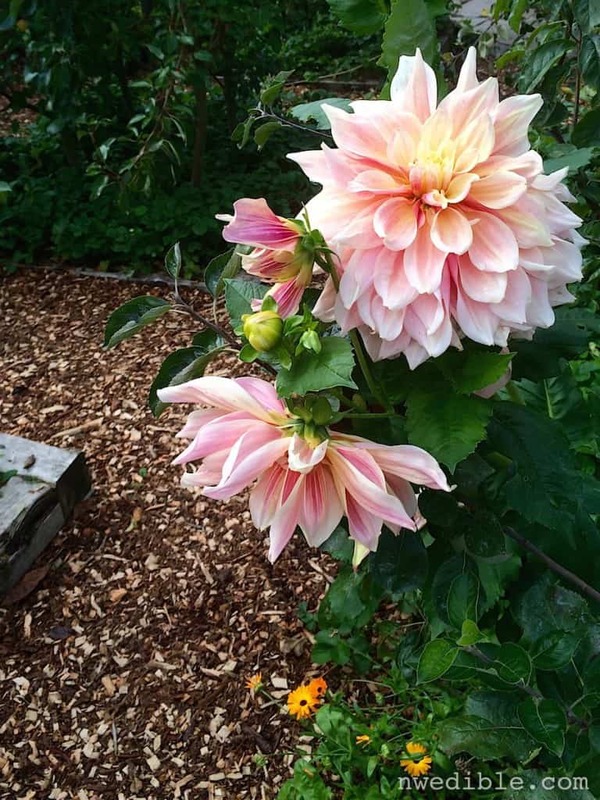 When in doubt: fresh mulch and dinner plate dahlias. All of this to make it look like I have the kind of garden that people should take pictures of. Lies, damned lies, I tell you. Anyway, all that yanking and pruning and hauling and shoveling led to some sore gardener muscles. Angela the photographer forced the issue for me, but most of us are, I’m sure, deep into garden clean-up time. If you over-exert yourself a bit with the rake, I’ve got just the solution: this easy Eucalyptus Bath Soak. Epsom salts are one of those old lady folk remedies that really work. Think of Epsom salts as like Chicken Soup for Your Muscles. 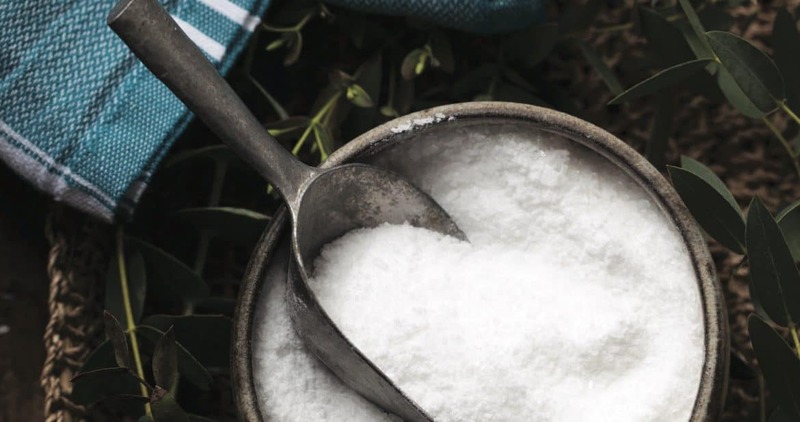 Epsom salts are pure magnesium sulfate, and soaking in an Epsom salt bath has been clinically shown to increase both magnesium and sulfate levels in the body. 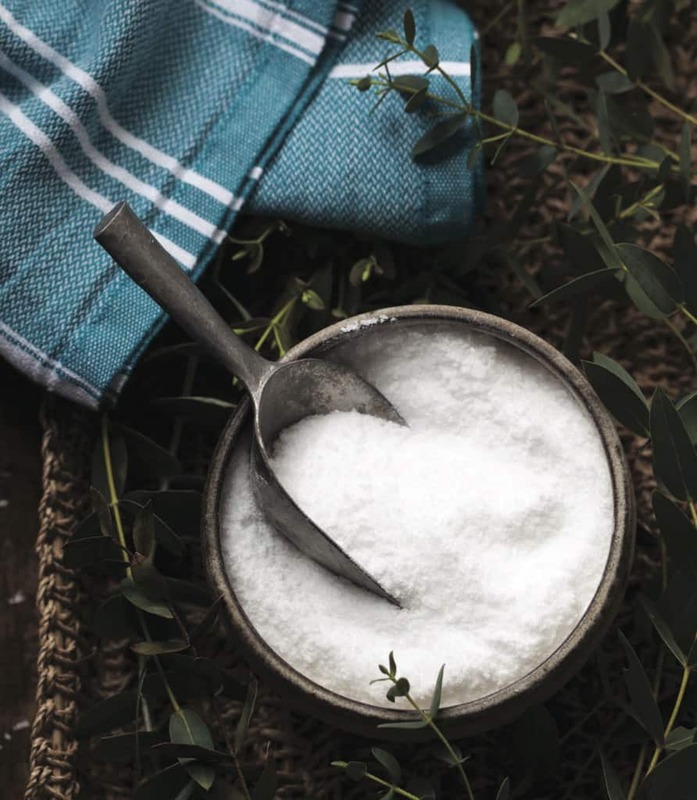 Magnesium is important to ensure proper functioning of muscle and nerve cells, and a good Epsom salt bath soak will soothe tired muscles, reduce surface inflammation from bumps and bruises, and relax away the soreness that comes after a long day in the garden. 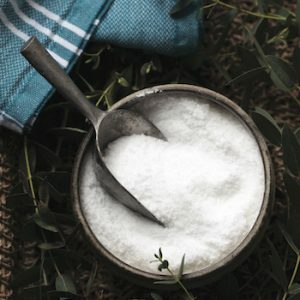 Two cups of Epsom salts in a standard-size tub provides the right dilution for the benefits of magnesium sulfate absorption through the skin. If you have a big soaking tub, you might want to double the amount of the soak you use. Thankfully, Epsom salts are pretty cheap by the pound, so it’s easy to be generous with this bath soak. I like the refreshing addition of eucalyptus here—I find it encourages deep breathing and a kind of spa-therapy vibe in the tub, but use whatever essential oils or blend you love. In a medium bowl, blend all the ingredients together. Add the bath soak directly to a hot bath, or store it in an airtight container for later use. The bath soak will last indefinitely, though the essential oil scent may fade over time. To use, add the bath soak to hot water and soak for 15 to 30 minutes. You can pre-order my book The Hands-on Home now via Amazon. For you shop-local types, you can find a local, indie bookstore that will be carrying the book by searching IndieBound. Here’s where I give myself permission to use my own recipe: (c)2015 by Erica Strauss. All rights reserved. Excerpted from The Hands-On Home: A Seasonal Guide to Cooking, Preserving, and Natural Homekeeping by permission of Sasquatch Books. Bath Soak photo by the charming, lovely and uber-talented Charity Burggraaf. Just pre-ordered your book.! You are my “go-to” expert for gardening and fermenting here in Seattle. I LOVE the Portlandia jewel-case reference in your Tomatillo Salsa post. The BF and I joke about how much I am becoming a Portlandia parody. “hi, my name is Annalisa and I have 6 things fermenting in my kitchen right now”. Thanks Erica, I appreciate your sense of humor. Yay, book! I’m super excited to see what the finished product looks like. 🙂 Also, yay epsom salts! I usually just chuck a handful of plain epsom salts into my bath and call it good. Adding essential oil sounds great! I went to the Powell’s website to order the book. * Now, how on earth is there a used copy available??? *And saw that you are on the calendar for an event! Definitely purchasing your book for myself, and one for my daughter.